This blog hasn’t become my sole source of income. I’m not being flown all over the world to share my experiences in the Maldives with my followers (yet), and I’m not spending time writing for anyone else but myself (sorry not sorry). This post is evidence however, that the time I’ve spent committed to writing, sharing experiences and documenting things I get up to, really makes a difference to my writing skills, and, in the job I’m in this is incredibly useful. A couple of weeks ago at work, a few of us attended a workshop all about storytelling. We spent the day considering what makes a good story, looking at key elements and structures that help create a really great story; Duarte’s Sparkline, Monroe’s Motivated Sequence and Freytag’s Pyramid. I had already set myself the challenge of writing a blog post to support my mini paid social campaign for London Fashion Week – targeting people who are interested in LFW with assets that showcase the cognitive dress. This workshop came at the perfect time and really helped me structure my post in a way that would engage and excite the reader. I asked Courtney, the course instructor, to take a look at what I had a written a few days later. Courtney came back with a lot of feedback, and naturally (yeah I’m a perfectionist) I wanted it to be amazing – you’ve got to push yourself out of your comfort zone. Having received the feedback email at 6pm Friday evening I panicked about it over the weekend, even tried to work on it during a train journey, but couldn’t access my emails. I came in Monday morning, in a fresh state of mind with a coffee and a bacon & egg sandwich (incredible what this kind of fuel can do for you) and set to work. Three hours later I had another blog written and with some final comments from Kate and Courtney I was ready to post by the end of the day. The last battle was making sure the title was attention grabbing enough but not too vague – tricky right? Last year when the cognitive dress was launch for the Met Gala I wrote a short post to share how exciting this IBM project was. In my research and planning for this latest post I re-read what I had written and was shocked at the quality of my writing. In less than a year my writing has improved dramatically – yes the tone of voice is still “me”, but I was genuinely surprised at my standards in April 2016! One of the key takeaways from the workshop was that we should be practising writing regularly; it could be a blog you share with friends, family or colleagues, or even just a private page for yourself. Storytelling is a huge part of our lives, whether we notice it or not – so it’s something that is relevant to everyone. Think of every book, film and conversation you’ve seen, read or had recently – stories are everywhere. Writing regularly really does help and trust me, you’ll notice an improvement over time – just read that old post of mine and you’ll see! See it now, buy it now, pay for it now, receive it now. The “Now Culture” is upon us; technology has enabled consumers to access products, services and information in an instant. Not only has it allowed access for consumers, it’s giving brands the opportunity to “show it now” through personalised banner adverts, emails and social media posts. When it comes to fashion marketing, our favourite retailers are tracking our cookies, delivering dynamic banner ads and encouraging us to head back to their site and purchase those wish list items. The fashion trends of the marketing world suggest hyper-personalisation across digital experiences is an imperative consideration to increase brand loyalty and enhance the “fan experience” on every level. The scary part is that consumer expectation is starting to transcend marketing, consumers want to be engaged and feel part of your brand; consumers want to know that you are designing products with them front of mind. Product Development can involve customers in a number of different ways, customer involvement as an information source – surveys, feedback etc, customer involvement as co-developers, working with the brand to develop products together or customer involvement as innovators, allowing customers to personalise their products in a custom build, we’re talking BMW Mini or Nike Trainers1. Many of us marketers struggle to deliver a personalised banner advert to the right customer at the right time, so how are we ever going to make the most of customers and data when it comes to product development? Consumer data is increasing exponentially on a daily basis, with every social post, purchase and click online containing valuable insight into your customer preferences. With this happening for 1,000s upon 1,000s of customers how is it even possible to analyse this data in time, for personalised marketing, never mind product development. Luckily AI is tackling this problem. This technology is giving us as brands the ability to analyse trends in real time, match brands with influencers, determine product matches based on personality and allow consumers to find the product or service that is right for them through simple search terms. Brands such as North Face2 are using this technology to help their customers navigate their vast product range. Macy’s3 is using AI to provide a personalised instore experience, similarly Hilton Hotels4 have introduced Connie, the robo-concierge powered by AI, to help customers with their needs whilst visiting cities around the world. But what about using AI for product development? Virgin Holidays5 is just one brand that has turned this into reality. They used customer emotions about holidays, documented on social media to influence the flavours required to create a new rum. Alex Da Kid6, a UK Music producer analysed sentiment, music and culture to influence a song he wrote at the end of 2016. Even the movie business7 is interested in what AI can do for them, and created a trailer based on previous “nail biting” moments. That’s exactly what Marchesa did. Typically known for ‘exquisite detailing with supreme femininity’, the use of AI technology with fashion house Marchesa was a surprising partnership. When considering the design of the dress, and with the belief that colour and images can indicate moods and send messages, Marchesa selected five key human emotions – joy, passion, excitement, encouragement and curiosity – that they wanted their dress design to convey8. AI technology enabled the brand to showcase what they stand for in a variety of ways. As fashion is experienced through visuals, the power of photography, be it on the runway or the red carpet, is essential when identifying the key brand elements of a fashion house. As part of the collaborative process, the technology analysed hundreds of images associated with Marchesa dresses in order to understand and learn the brand’s colour palette. 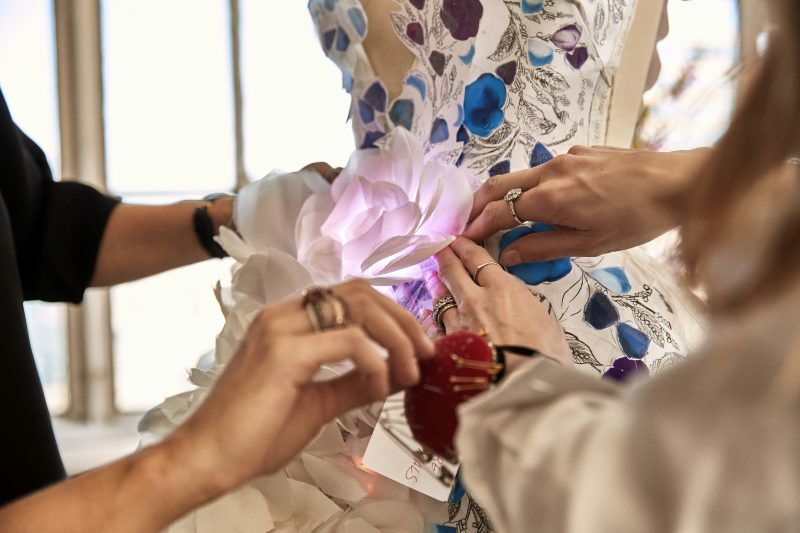 Technology was also used to help pick an appropriate fabric, true to the Marchesa brand but that would also enable the final technology element of the dress come to life. This final signature moment for Marchesa meant that the dress incorporated LED lights allowing it to change colour in real time, at the Met Gala, where the dress debuted. Through analysis of social sentiment, the LEDs changed colour in real time as the conversations unfolded throughout the course of the evening; “the idea that a dress could change colours, or that lights could come on, it has this magical component – now this is possible” – Georgina Chapman, Marchesa. This is just one example of how technology is creating unique brand experiences and taking personalisation to the next level. It’s back to the drawing board, embedding consumer and brand data into developments from day one, not just when we take products to market. As consumers we want to design it now, buy it now and experience it now – and we can – thanks to AI – reasoning, learning and understanding the vast amounts of data available. Having seen such advancements in the fashion world, it will be intriguing to see how technology impacts during the AW17 catwalks across the world. Will other brands be bringing this magical element to their designs?